I’ve been watching an online audio mastering course (called DIY Mastering) from Jesse Cannon (a great audio engineer). In it, he was talking about how he always checks his work on cheap speakers and Apple earbuds, since that’s what most people use to listen to music. 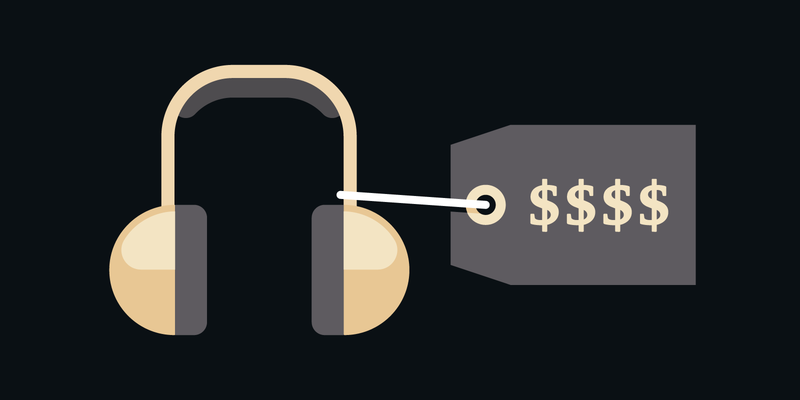 It got me thinking: are expensive headphones really necessary for mixing podcasts? Do you really need the best gear to make great work, or are you just procrastinating? My goal for this episode is to encourage you to do more with what you have and not fall into the trap of believing that better gear is the secret to success. Don’t fall into the trap of believing that better gear is the secret to success. You don’t need great headphones or speakers that are made for mixing music to make a podcast sound good. The difference between cheap and expensive headphones is subtle, but some people want and need that subtlety. Quality gear usually lasts longer than cheap gear. Terrible sound quality can ruin great content, but great sound quality won’t make terrible content interesting or compelling. Invest in educating yourself at first rather than investing in better gear. All the expensive gear in the world doesn’t make a difference if you’re not creating stuff. Constraints can help you create great things. You earn the right to better gear by learning and doing. 00:20 Don’t fall into the trap of believing that better gear is the secret to success. I’ve been going through an online course about audio mastering from a mixing and mastering engineer, Jesse Canon. In this course (DIY Mastering) he talks about how he always checks his work on cheap speakers and Apple earbuds. 00:54 He said, “It’s because that’s what most people use to listen to music these days.” He mixes the music on expensive speakers and headphones, but then he checks on cheap headphones because he wants to know what it sounds like. This set a lightbulb off in my head, and made me wonder: Do you have to have expensive gear when you’re making podcasts? And are expensive headphones really necessary for mixing podcasts? Why Do People Recommend Expensive Headphones and Speakers for Mixing and Mastering music? 02:23 Mixing and mastering are all about making choices about how to make audio sound. Better headphones and speakers let you hear more detail in your audio so you can make more informed decisions about how to shape those sounds, how to do EQ, compression, reverb, and special effects. 02:50 Podcasts are not that complicated. Most of the time, a podcast is just a single person talking. You don’t use a bunch of effects (unless you’re making a show like Deep Vault). There aren’t a bunch of changes in volume and dynamics. It just needs to be consistent and pleasant to listen to. Much of that comes down to recording with a good mic, setting input gain levels correctly, using good mic technique, and not recording in a noisy room or a room with a ton of natural reverb or echo. What Headphones Are Your Listeners Using? 03:34 Most people listening to podcasts are probably either using Apple earbuds, cheap earbuds, less than $100, or listening in a car. I would be very, very surprised if the number of people listening to podcasts on audiophile quality, expensive gear was higher then 5% or 10% of the overall population. I don’t think you need great headphones or speakers that are made for mixing music to make a podcast sound good. 04:03 I’m an audio nerd. Before I got into editing podcasts, I was studying recording, mixing, and mastering music. I want great audio gear, but these days, I mix all the podcasts on the seanwes network on $10 Panasonic earbuds. Even though I mix all the seanwes network podcasts on cheap earbuds from Amazon, our listeners don’t complain. 04:29 In fact, most people talk about how great the sound quality is. That’s because Sean invested money in some great mics, like the Shure SM7Bs, and some pre-proccessors, the DBX-286s. He knows how to set input gain levels correctly and he uses pop filters. 04:46 The only bad thing I can say about the recordings that Sean makes is that he doesn’t have sound treatment in his room. I can hear a little bit of the room sound, but it’s not enough to bother the majority of his listeners. I don’t think most people even notice it. I notice it because I’m a nerd, and I pay attention to things like that. Why Do People Want to Buy Expensive Gear? 05:39 They think the gear is why the pro has had success. So they drool over the gear, over the expensive microphones, the expensive computers, the expensive headphones, the expensive plugins, or whatever the pro is using. They’re forgetting the years that the pro invested in learning everything, making mistakes, going through processes, putting out work, trying, experimenting, failing, and trying again. 06:53 Do they sound way better? No. Will they help you make a podcast that sounds drastically better? No. 07:05 More expensive headphones are often more confortable. These HD 600s I have are stupid comfortable. I can wear them for 12 hours, they sound great, feel great, and they’re pretty lightweight. They’re a joy to wear. Also, quality gear usually lasts longer than cheap gear. The cheap $10 headphones that I buy will often break after six or eight months. A good pair of headphones should last you for years, maybe even decades. 07:34 If you’re going to spend some money, ask yourself, “Should I buy three pairs of $10 earbuds or a pair of $30 headphones that will last the same time as the three pairs of cheap headphones?” I think that’s a tossup, but reliability and quality are worth paying for. Finally, you also get to feel fancy when you have expensive headphones. That’s more about your personal ego, but it does feel good to have great gear. 08:11 I like having nice things, and it’s fine for you to want that too. It says something about you, that you’re willing to invest in quality gear for whatever kind of work you do. If it’s audio work, it’s nice to be able to have this gear, and there’s nothing wrong with that, with a little bit of showing off, taking pride in the stuff that you invest in. What’s More Important: Great Sound or Great Content? 09:08 Crappy gear can ruin great content, but great gear isn’t going to make average or boring content interesting or compelling. Time spent looking at and lusting over fancy gear you don’t have is time you could have spent making stuff with the gear you do have. It’s a distraction. It’s procrastination. 10:09 Time spent looking at fancy gear is time that you’re not spending creating. The thing you’re giving attention to is taking up your headspace, so it blocks out everything else from your life. Let’s use notebooks as an example. I know a lot of people write and a lot of people draw. What benefit does a $40 notebook have over a $3 notebook? They’re both paper, and you can write on either one of them. Will a $40 notebook help you write better than a $3 notebook? 10:55 What about writing apps? Do you have to pay $40 or $50 for Ulysses or $100 for Scrivener, or could you write a book or a blog post in the TextEdit app in your Mac? It might not look exactly how you want, but you could get the job done. My friend Sean could write an entire book inside of the Notes app. 11:44 When I started podcasting, the microphone I had was a $150 Shure PG27 USB microphone. I thought I was fancy at the time. I have $250 BETA 87A now, running into a $500 interface… I have so much more now than when I started. 12:18 The point is that I got started with something, with what I could afford at the time. It didn’t sound amazing, but it sounded okay. I had to go through the process of learning all the different pieces that make up podcasting. Eventually I got to a point where I wanted to get better at my craft and I invested in a better microphone. What really made the difference in my sound quality was learning how to do things like EQ and compression, mixing and mastering. If you have to choose, invest in educating yourself rather than investing in better gear. 13:11 Don’t get distracted by the gear. Don’t procrastinate by spending a bunch of time reading reviews and drooling over expensive gear. At the end of the day, all the expensive gear in the world doesn’t make a difference if you’re not creating stuff. If you don’t have an audience now, buying super expensive gear isn’t going to magically bring you a ton of listeners, viewers or readers. 13:48 I do believe that there is a minimum threshold of quality you should strive to meet, but it’s in the range of hundreds of dollars, not thousands or tens of thousands. If you’re just getting started or you’re a year or two into it, buying a $10,000 mic is not going to make your podcast better than buying a $250 microphone. You’re not going to know how to use it to the best of of your ability. You may have other problems with your podcasting setup and your workflow that you’re not even aware of yet. Improve what you can, and don’t spend all your time looking at gear. 14:32 I’ll talk about a podcaster first, Tim Farriss. I’m sure some of you have heard Tim Farriss before. I don’t like the way he starts off his episodes with five minutes of ads, but that’s my only complaint. Other than that, he has a lot of great content. It’s not always stuff I’m interested in, but you can’t argue that he’s a very interesting person, and he’s producing very interesting content, especially on self improvement. That being said, based on his sound quality, it sounds like he’s using a $100 USB microphone. 15:17 Most of the time it sounds like he uses a Skype call recording when he interviews people. He doesn’t have the most amazing sound quality on his podcast and he starts every episode with minutes of ads, which is kind of annoying, but it doesn’t matter. Tim Farriss has a huge audience because he’s producing amazing content. He’s focused on making great content and not having the best gear or sound quality, and he’s winning because of that. 15:52 Another example is Robert Rodriguez. I heard him on an episode of Marc Maron’s podcast. He was talking about how he made his very first movie (El Mariachi) with a $7,000 budget. It was a tiny, tiny budget, but the movie blew up and ended up making $2,000,000 in the US. I watched it, and it was obviously low budget—but it was enough to kickstart his career. 16:47 He said that because he had so little money, he only shot a take or two for each scene. He did the best he could with the constraints he had, and he didn’t wait until he could afford the best movie gear. You can create great work with constraints, and oftentimes, it helps. 17:16 If I had access to all the most amazing microphones, the best headphones, computers, audio interfaces, and all this stuff, I still couldn’t sit down in a studio with a band and make a record that sounded as good as someone who’s been doing it for 20 years. There’s too much that I don’t know. The gear isn’t what’s holding me back, it’s the knowledge. It’s practice and years of experience. 17:50 Remember that most people are listening on affordable headphones or Apple earbuds. You don’t need expensive headphones to make a podcast that sounds good. It’s ok to get to know the gear and invest in good gear if you want to, but don’t trick yourself into believing that good gear will guarantee you success. You have to put in the time to learn and hone your craft. 23:10 To me, expensive for a microphone is more than $400. Expensive for headphones is more than $200 or $300. It doesn’t really matter, though: You earn the right to better gear by learning and doing.